Chad Slife has been principal of Cobb Elementary School for three years. Along with the usual playground noise at Cobb Elementary School, at 2725 California Street near Scott, it’s possible to hear something else: the roar of Tiger pride. That’s because the students at Cobb, Tigers all, are justifiably proud. The vibrant brick red school, which underwent a $7 million modernization a few years ago, now boasts a new library/media center, a redesigned play yard complete with a garden and outdoor classroom spaces, and countless other upgrades. Established in 1865 as the Emerson School, it was renamed in 1978 for Dr. William L. Cobb, who became San Francisco’s first African American principal in 1947 and for 16 years led the school now named for him. Slife did his undergraduate work at the University of Southern California, then entered Teach for America, a national program that places college graduates interested in teaching at low-income schools for two years. 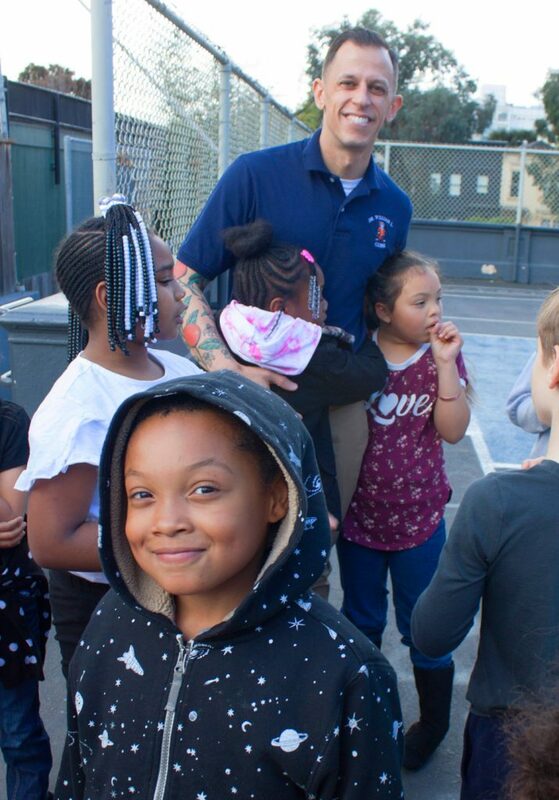 After earning a master’s degree in education at San Francisco State and teaching in schools here and in Los Angeles, he came to the neighborhood as founding assistant principal of Gateway Middle School at Geary and Scott. Three years ago, he moved to Cobb. Parents are becoming more involved in the school. While parent volunteers have long worked in the classrooms and helped out with special events and fundraising, the first PTA was established this year. The school also gets a boost from its community partners. Nagata Dance in Japantown partners with the school for its K-5 arts enrichment. And Presidio Pizza Co., nearby on Divisadero, is the sponsor of Cobb’s Student of the Week certificates, which come with a free slice of pizza. Cobb also partners with nearby Drew School, Town School and Gateway High School, which provide older buddies for Cobb students. On a Saturday at the end of April, a program called Rebuilding Together brought parents, teachers and Salesforce staffers together to renovate the school’s garden and add a new mural. Slife attributes the students’ improved achievement levels — “still low, but better every year” — to the school’s nurturing environment, which is designed to bring out the intellectual best in each student while honoring individuality through song, dance, drama, instrumental music and visual art. Cobb also offers a free after school program, sponsored by the Buchanan YMCA, that runs from the end of the school day until 6 p.m.
Then there are the popular Tiger Tickets. A student can earn a Tiger Ticket for all sorts of good behavior, including being courteous and respectful, behaving politely or helping another person. Tiger Tickets can then be spent in the school store on school supplies, toys or “privilege passes.” Enough passes might win lunch with the principal or a class Popsicle party. The lure of Tiger Tickets is strong for everyone. In educationese, it is PBIS: Positive Behavioral Interventions and Supports. In kidspeak, it’s simply fun. From all angles, it is a way to encourage individual growth and community spirit. Cobb students are mostly from the Western Addition, and most are children of color. Some of their parents and grandparents studied in these same classrooms. Now that has begun to change. “At Cobb, we know our kids,” says principal Chad Slife, who will not be returning. It’s tough juggling a full day’s activities on an urban campus open from 8:30 a.m. to 6 p.m. while keeping track of 160 students whose names you know and can spell. “I’m just not the kind of principal who can close the door and get other things done,” Slife says. It takes a toll, and Slife recently told his staff he will not be returning next year. “It’s just time,” he says. “This school can really drain you.” He notes that his three years are the longest tenure of the six most recent principals at Cobb. 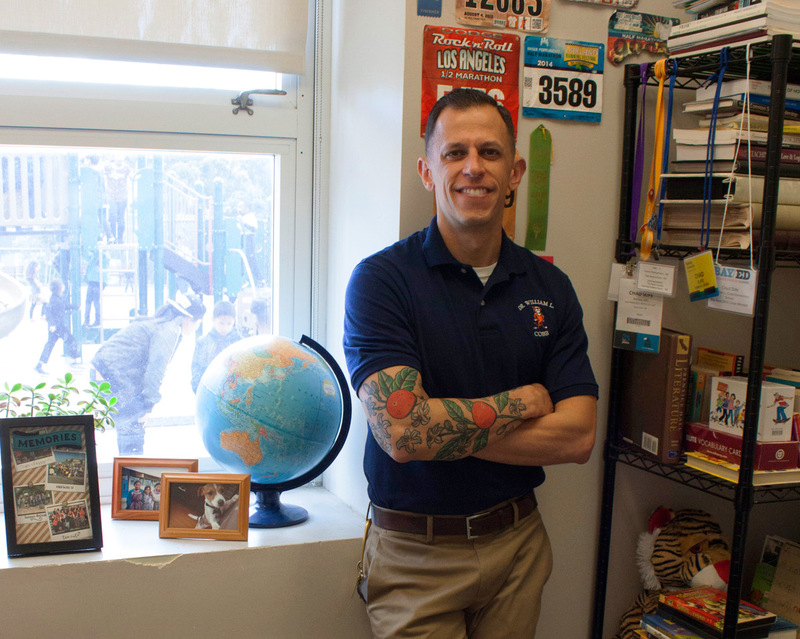 “This is just not a sustainable position for one person,” he says, with no assistant principal. Slife is hoping there will be a position for him next year at school district headquarters. Slife is a fitness buff who teaches cycling classes and is a certified personal trainer. He has run marathons or half-marathons in 22 states and plans to get to the rest. He’s clearly invested in education for the long haul, too.